I usually use almond flour, but this recipe is using coconut flour. I will post almond flour version another day. In a small bowl, mix coconut flour, ground cinnamon, and Truvia(2.2g). In a separate bowl, mix cream cheese, butter, and vanilla until well blended. Stir in coconut flour mix. Divide the dough into four and roll each into a ball. Refrigerate for about 30 minutes. Mix raspberries, Truvia(1.1g), ground cinnamon, salt, lemon juice, and xantan gum. Set aside. Place each ball in between parchment papers and roll three of them out to 3inch circles, and one to a rectangle (approximately 3x4in). Use the round doughs to cover the greased tartlet pans. Use your fingers to press them down and patch any cracks. spoon on 1/3 of the raspberry mixture. cut the rectangle shaped dough into 12 thin strips and use them to cover the top. Bake at 325F for 10-12 minutes or until edges start to turn brown. 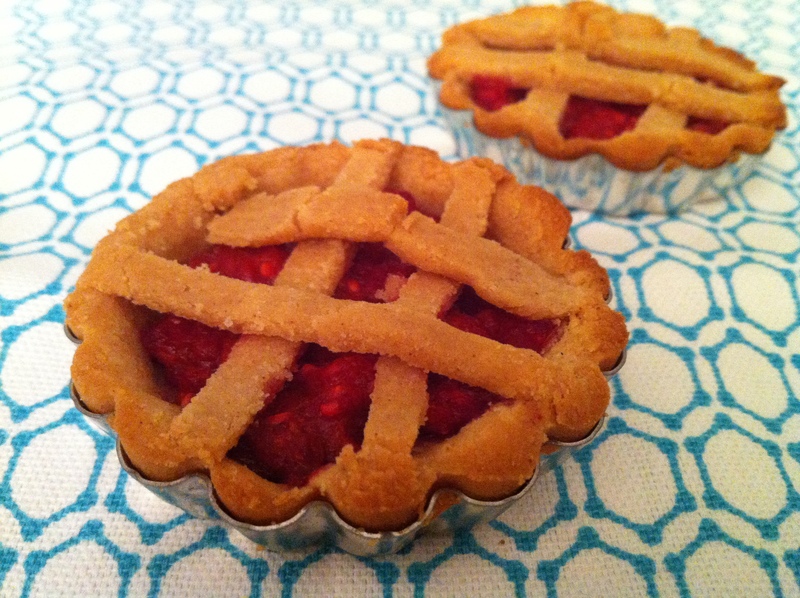 For extra fat, place extra butter cubes on top of raspberry mix before putting the top pie crust. You can also decrease the amount of coconut flour in the crust for better ratio.